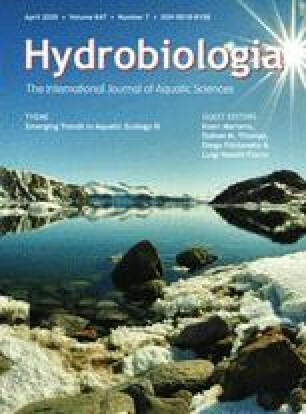 Photosynthesis and respiration by the epilithic community on cobble in an arctic tundra stream, were estimated from oxygen production and consumption in short-term (4–12 h), light and dark, chamber incubations. Chlorophyll a was estimated at the end of each incubation by quantitatively removing the epilithon from the cobble. Fertilization of the river with phosphate alone moderately increased epilithic chlorophyll a, photosynthesis, and respiration. Fertilization with ammonium sulfate and phosphate, together, greatly increased each of these variables. Generally, under both control and fertilized conditions, epilithic chlorophyll a concentrations (mg m−2), photosynthesis, and respiration (mg O2 m−2, h−1) were higher in pools than in riffles. Under all conditions, the P/R ratio was consistent at ∼ 1.8 to 2.0. The vigor of epilithic algae in riffles, estimated from assimilation coefficients (mg O2 [mg Chl a]−1 h−1) was greater than the vigor of epilithic algae in pools. However, due to the greater accumulation of epilithic chlorophyll a in pools, total production (and respiration) in pools exceeded that in riffles. The epilithic community removed both ammonium and nitrate from water in chambers. Epilithic material, scoured by high discharge in response to storm events and suspended in the water column, removed ammonium and may have increased nitrate concentrations in bulk river water. However, these changes were small compared to the changes exerted by attached epilithon.